Rare occasion where something costs more in the US I guess. $600AUD RRP here and I got it for a touch over $500AUD. ($427 and $356USD respectively) They also need an amp, but a cheap T-amp will be plenty for desktop use, the Lepy 2024 is a mere $24 on Amazon. The active speaker in my Audioengine A5 pair died, which made the passive one attached to it rather useless, As a result of that experience I'm not so hot on active speaker solutions anymore. Passive speakers will last pretty much forever without having to worry about any electronics failing. Fortunately I was able to talk to another Audioengine retailer (the original had long since lost distribution rights) and have them sell me a refurb single passive speaker to pair up with my surviving one so I can at least salvage some use out of it, again with the use of a cheap T-amp. I'll probably give them away now though since I have both the old and new Monitor Audio sets which are superior. And THOSE are a mere $400! Yes, I did worry about that in my Yu2s when I bought them...buuut I did get them for less than half their normal price, so I'm not too torn up about it. I'm currently on an ancient i3 2120 @ 3.3 ghz, 8 gb ram and an R9 380 4gb, which performs quite nicely without any serious bottlenecking from the CPU, as it seems most games are heavily GPU-bound these days. Wow this thread 10 years old! DISP - Crossover 4K 40"
Why 2133MHz RAM? I'd wager 16GB 3200Mhz is quite a bit faster/more useful than 64GB 2133MHz. Yes, memory speed matters once again (don't ask me why). The theory is consoles - game engines are now written on the basis of having the limited (in-size) but very fast shared memory that the current-gen consoles have. The gains vary massively from game to game, but Fallout 4 to give an example benefits massively, well into double-digit framerate gains. Considering that DDR4 has high latency, I would think so. Those 64gb would only be more useful in a situation where you would need more then 16/32gb of ram for an application. But hey you can always make a RAM disk. Edited by Sarex, 22 May 2016 - 12:23 PM. 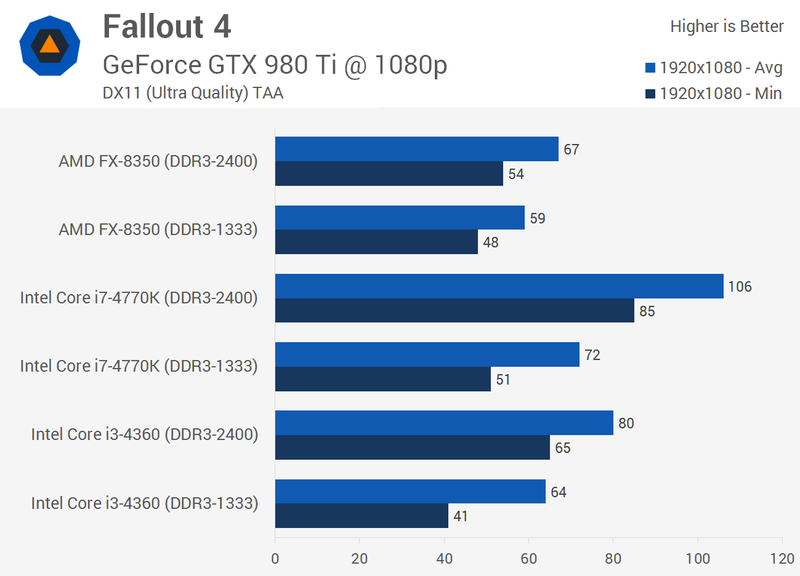 This one benchmark tells the story, but granted FO4 is an extreme case. Other games will show modest gains and others again none at all. Well I put in some Corsair Vengeance lpx 3200 32GB (thanks Newegg sameday), defaulted to stock 2133 until I loaded the xmp oc profile and got 3200. Then my Skylake temps shot up 10 degrees lol, so I lowered the oc a bit. Hopefully the extra ghz on the ram will compensate? I forget whether I'd mentioned that one of my Dell U2711 displays is dying. I had held out on replacing it for a while since the flaw is only really obvious on relatively bright images. A month or two ago I got an Asus MG279Q to replace it, except that I had to get my sister who lives interstate to buy it from a bricks and mortar shop so I don't actually have it yet. Today I saw a nice deal on the recently superseded U2715H for $560AUD (~$405USD) delivered, so I ordered one (and was sorely tempted to order two), so once everything arrives I'll be running triple 27" displays. The Asus will have to be the centre screen because of the Freesync functionality, even if it probably has marginally inferior display quality. Trying to match up three completely different panels will be tricky, so we'll see how it goes. Just for the hell of it I also added a P2414H to the order, which has an identical panel to the U2414H, but being the "professional" series it has DVI instead of HDMI. I'll probably use it as backup, unless I have issues matching my surviving U2711, which is a wide-gamut display, to the standard sRGB gamut of my two replacements. Unfortunately one big issue created by multi-display setups is speaker placement. Even with my two current displays, my speakers end up being placed too far apart, almost to either side of me, which wrecks any sort of positional sense for games that require it. 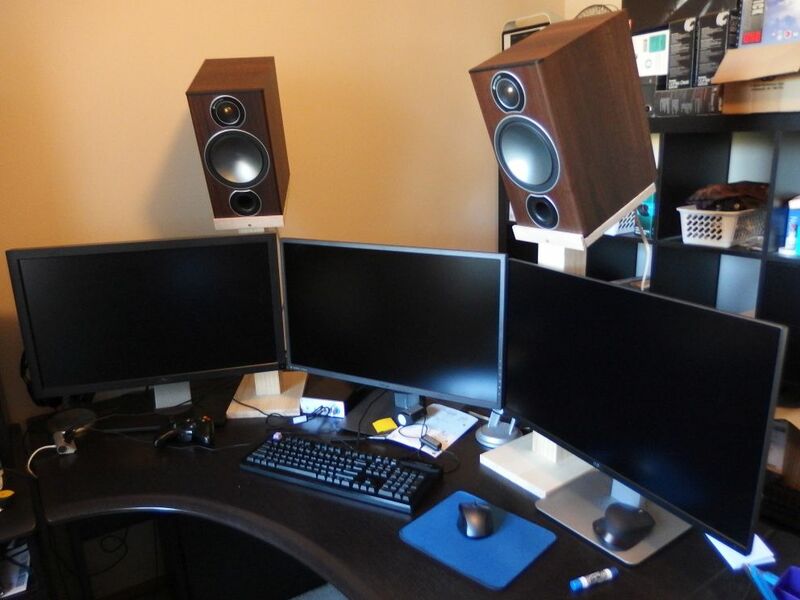 With three, I will probably have to build a couple of stands to raise the speakers above the monitors, which is risky in itself because they're pretty hefty at 5.3kg each, and I'll have to tilt them down towards me somewhat. Good ol' Blu-tack will help secure them to the stands somewhat, but it's still far from an ideal solution and is probably flirting with disaster. Clearly someone needs to come up with acoustically transparent OLED panels, fast. New displays arrived and set up. The thinner bezels compared to the gigantic ones on the old model are nice to have, and the anti-glare coating is much more sensible this time. Also pleased to report it happily does 1440p/60Hz through HDMI, a combination I could never get to work previously as all the elements in the display chain - graphics card, cable, monitor - need to support it. I didn't want to use the DisplayPort despite the monitor supporting daisy-chaining, as I'm concerned about potential issues with Freesync and the bandwidth required to push 144Hz. As expected, the new display doesn't quite match up cleanly with my surviving U2711 even after calibration, but fair enough because despite the names, they're fundamentally different displays. 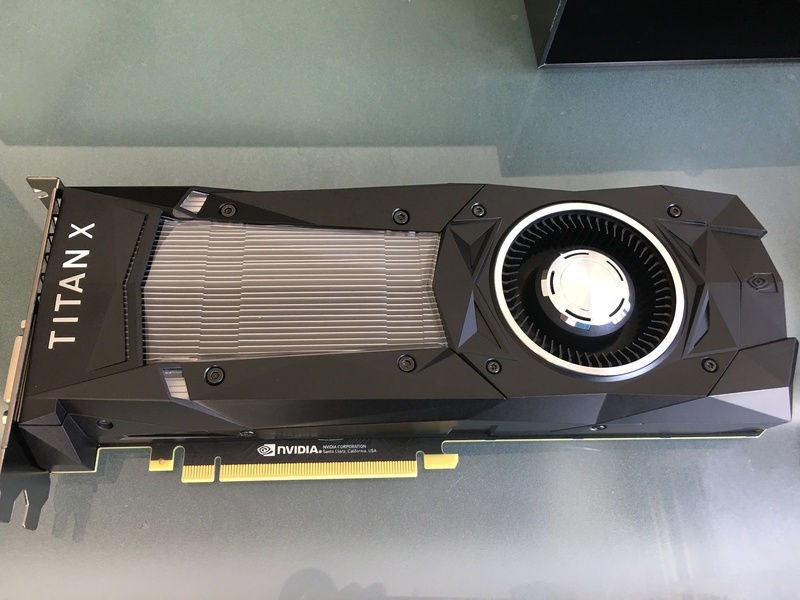 The new one is a more consumer-oriented model, whereas the proper successor to the U2711 is the UP2716D, being the model aimed at graphics professionals. I'm experimenting with the P2414H in portrait mode to the left of the two 27" screens. I'm not best pleased with the results right now, mainly because the much larger pixels it has (1080p at 24" vs 1440p at 27") makes it awkward to use as part of the extended desktop, and because the different viewing angle to the centre of the screen (which lines up with the top third of the landscape displays) means it looks a bit off in terms of colour and brightness. No big deal though as it's a temporary arrangement, the question to come afterwards will be whether I can reconfigure my desk to fit triple 27" screens in landscape orientation. 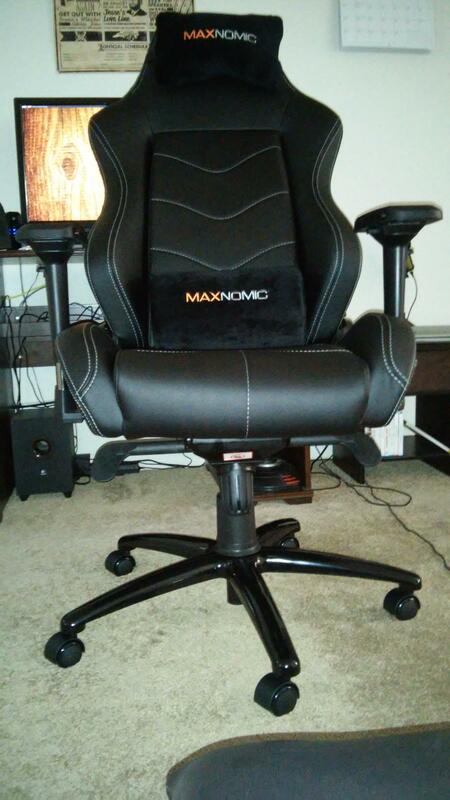 It's a Maxnomic Dominator Black, shown with the lumbar and neck pillows. I'm not a fan of the lumbar pillow, even though it is so wonderfully plushy, simply because I feel the chair has plenty lumbar support without it. I am a big fan of the head pillow, it is divine. The chair tilts, folds back far enough into a position you could sleep in, rocks, and the arm rests raise and lower, move forward and back, and twist into several positions. It's super duper comfortable and feels rock solid. I would highly recommend it if you have money to burn (it's quite expensive). Edited by Keyrock, 16 June 2016 - 03:08 PM. Got my Asus MG279Q finally. For now I'm just going with a triple 27" landscape setup, with the FreeSync monitor centre. I've set up FreeSync and it's working well enough with The Witcher 3 and it's definitely an improvement since the game generally runs below 60fps on my setup, making it the prime case for the technology. On the other hand, it's certainly a matter of compromise - I can definitely tell it's a monitor with lesser build quality than the Dell Ultrasharp range, even though it ended up costing more. It's inferior in terms of build quality, the bezels are relatively thick for a display of this age, the interface has some usability issues (the buttons are infuriatingly placed at the back of the screen making them very hard to access in a multi-screen setup), there are a bunch of gimmicky image enhancement options, and most importantly image quality. For something like general web browsing for instance, text has a subtle but annoying blur to it, almost as if the screen has a thin sheen of Vaseline over it, and once calibrated it still doesn't quite match the colours of the Dells. (I had to turn brightness down from 100 to 20-odd, but the white point was actually pretty good out of the box) There's also one dead pixel, though at least it's near a corner. In the end, due to a lack of alternatives available on the market, it's a compromise I'll need to live with for now (Acer have a similar model, no doubt using the same panel). Would I buy this screen again given the choice? I think I might have opted to wait it out until a better panel for general desktop use was released. OLED where art thou? P.S. There was an expired redemption coupon for Assassin's Creed Unity on UPlay included. I count that as a bullet dodged. I'm going to go for it's big brother the PG279Q, I decided to wait for the next gen of ultrawide monitors, which will come by the end of next year, or even maybe an OLED monitor if some new appears for them. Completed my ghetto speaker stands. To be honest, it's kinda scary, as if one day they'll collapse and crush me, but at least my positional audio will no longer be stupidly out of whack. Fortunately I remembered my high school maths and the stands are reasonably balanced, and the speakers are secured with Blu-tack for that extra peace of mind.